Tampa has seen a resurgence in tourism since Ybor City was named a National Historic Landmark and now enjoys a very lively nightlife. The beautiful beaches in the area, Busch Gardens and some excellent museums make a visit to the Tampa area worthwhile. Ybor City is a great place for a memorable meal or a night out on the town. See the Ybor City Chamber of Commerce www.ybor.org (813) 248-3712. Bern's Steak House (813) 251-2421 is Tampa's landmark restaurant with a wine list of 7000 labels and 1800 deserts to choose from. Enjoy dessert or a cigar in one of the specialty rooms after your meal. The Museum of Science & Industry (813) 987 6000 is one of the largest and one of the best hands on science museums in the state. Busch Gardens 813 987-5171 is the area's biggest theme park. It has one of the best roller coasters in the state and a fantastic zoo with over 2500 animals displayed in African themes such as the Serengeti Plains and the beautiful, tropical Myombe Reserve. Tickets for a combination Busch Gardens/Adventure Island are a good value. Located adjacent to Busch Gardens, Adventure Island is a water park with a huge swimming pool, waterfalls, diving platforms and tube slides as well as a 76 foot free fall body slide. 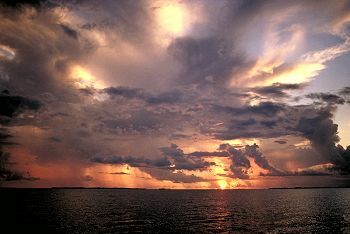 Tampa/Hillsborough Convention & Visitors Bureau (813) 223-1111, 800 224-1733, www.gotampa.com.